Researchers at the U.S. Census Bureau estimate that roughly eight in ten Americans work for companies that sponsor a 401(k) or similar tax-deferred retirement plan but just 41 percent of employees are actually utilizing these savings vehicles. 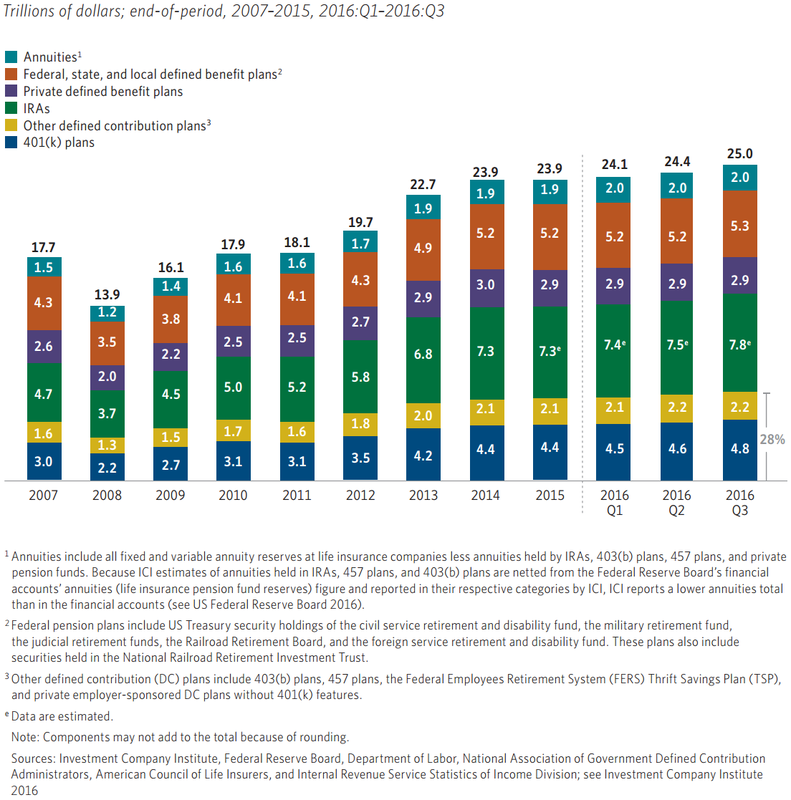 Although that implies that only about a third of employed Americans are regularly contributing to a workplace retirement account, the amount of money that these individuals have been able to set aside is significant. For example, a new study from the Investment Company Institute (ICI) calculated that $7.0 trillion were held in 401(k)s and other defined contribution (DC) plans at the end of the third quarter of 2016 (most current data available). That was a significant rebound from just $3.5 trillion in 2008 during the heart of the “Great Recession,” accounted for more than a quarter (28 percent) of all U.S. retirement assets at the end of Q3, and equated to almost one-tenth of Americans’ aggregate financial assets. The ICI report also revealed that the vast majority of DC participants in America continued to save with their workplace-provided retirement plans during the first three quarters of 2016. 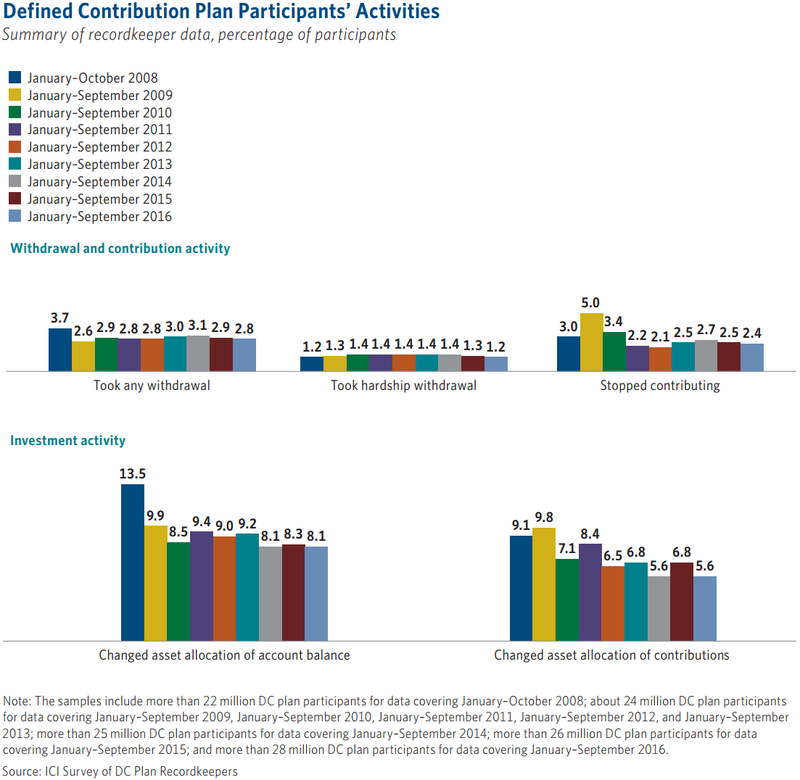 Specifically, only 2.4 percent of participants stopped making contributions to their 401(k)s or other DC plans during the first nine months of last year, well below what was seen at the end of the recession (5.0 percent). 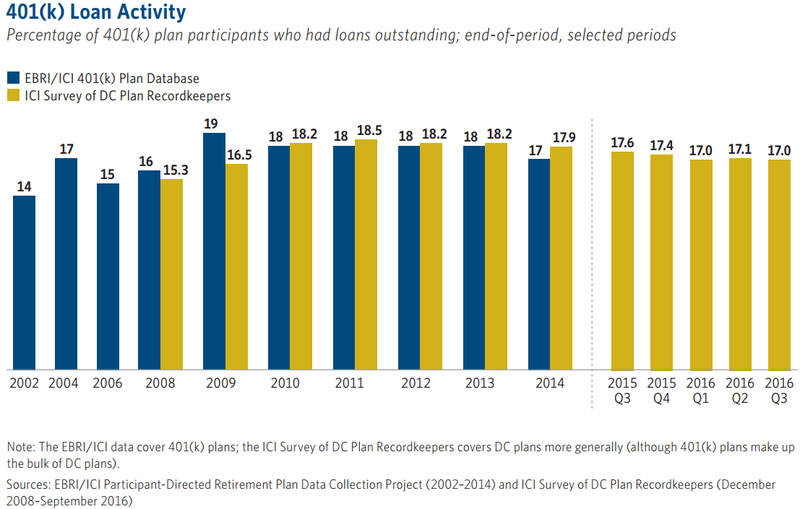 Further, hardship withdrawals were taken by just 1.2 percent of DC plan participants in Q1-Q3 2016, matching the record low, and only 2.8 percent of participants took any sort of withdrawal. 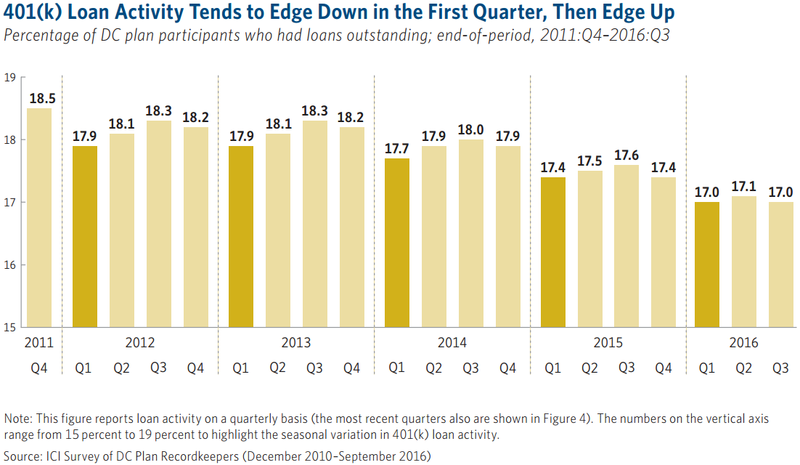 As for borrowing activity, 17.0 percent of all 401(k) plan participants had a related loan outstanding at the end of the third quarter of 2016, the best reading since 2009. Loan activity in the third quarter was also down slightly from Q2, which goes against the recent seasonal pattern where 401(k) borrowing tends to peak in Q3. That could be related to the tightening labor market and slight uptick in wage growth that are providing Americans with more disposable income and lessening the need to tap into their retirement assets early.